Mumbai: Kolkata giants Mohun Bagan failed in their bid to defeat Mumbai FC in their home venue for the third season in a row as Wednesday's I-League game between the two outfits ended in a goalless draw in Mumbai. Mumbai FC, who made three changes to the starting line-up, including new signing Alex Silva of Brazil, took time to get off the blocks. The visiting Bagan side created a couple of chances during this period with Haitian Sony Norde testing goalkeeper Laxmikant Kattimani with a snap long essay in the 13th minute. That proved to be a wake-up call for the home side as they gradually clicked and they started to launch a series of raids at the Bagan goal. However, they were unlucky not to take the lead on quite a number of occasions in the first period and were also robbed of a goal when Thoi Singh managed to find the net, but referee Tejas Nagvenkar disallowed the goal ruling that the striker was offside. 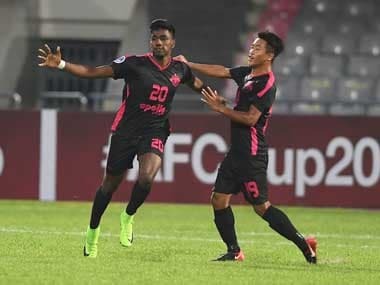 The Mumbai team was also denied by the wood work when Farukh Choudhary did well to lunge forward to meet Thoi's floater from the right but diving header, that had goalkeeper Debjith Majumder beaten, came back off the upright in the 32nd minute. Earlier, Silva came close to scoring from two well executed free-kicks which were parried away by Bagan's custodian Majumder for corners. The Mumbai side once again came close to taking the lead but successive attempts from and finally Trinidadian Theobald's try from close was saved by an alert goalkeeper Majumder who did well to push the ball away from a melee and the two teams went into the break locked goalless. The second half did not witness any exciting goal-mouth action barring the odd one. Hardly any attempt ws created at either end and the game finished in stalemate. Mumbai FC goalkeeper Kattimani was declared 'Man of the match' and received a cash award of Rs 10,000. 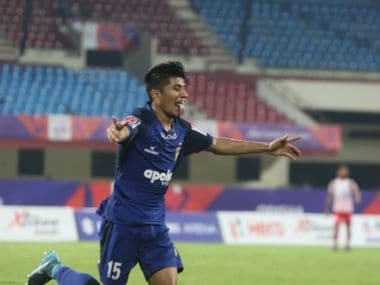 The draw enabled Bagan increase their points tally to 18 from eight games and kept them in second spot on the table, while Mumbai FC, who will next take on defending champions Bengaluru FC in a 10th round match in Mumbai on 18 February, remained on eighth spot with seven points from nine matches. A listless East Bengal dropped crucial points as they were held to a 1-1 draw by Shillong Lajong in the I-League football fixture at the Kanchenjunga Stadium in Siliguri on Wednesday. Fresh from their goalless stalemate in the derby against Mohun Bagan, East Bengal were forced to play a catch-up game after Shillong's Samuel Lalmuanpuia drew the first blood in the 20th minute. Willis Plaza headed past Vishal Kaith to equalise for East Bengal in the 45th minute but they could not get any goal in the second half with the Shillong goalkeeper putting up a brave front. This was the I-League leaders' second successive draw after a six-match winning streak and they now have 21 points from nine matches, which would allow Mohun Bagan to do all the catching-up. It would be a morale booster for the Thangboi Shingto-coached side that has a point after a loss to DSK Shivajians at home. They now have 13 points from nine matches. This was their first away match after five consecutive home outings and they have lost to the Trevor Morgan-coached side only once in five outings. Shillong Lajong faced East Bengal four times last season -- twice each in I-League and Federation Cup. While East Bengal won the first I-League game 4-0 courtesy a Ranti Martins hat-trick, the last three games they have lost twice and drawn once, getting out of Federation Cup in the first round. 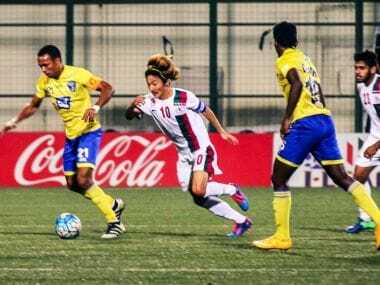 Following an attacking start by East Bengal, the young Shillong outfit, with eight under-22 recruits, stepped up the tempo. Aser Pierrick Dipanda ran in from the centre and played it wide to an unmarked Bipin Singh whose cross was headed in by a surging Lalmuanpuia. Australian signing Chris Payne made his debut in red and gold colours as he started alongside Plaza in Morgan's diamond formation. The home side straightway pressed for a lead, earning a second minute corner, and there were a flurry of attacks with none of them resulting in a goal. Wedson's volley went over the bar in the fourth minute while moments later Plaza went past four defenders, only to shoot away with a weak leftfooter. Payne had a 58-minute appearance on his debut but the Aussie failed to make much of an impression and was replaced by Robin Singh. 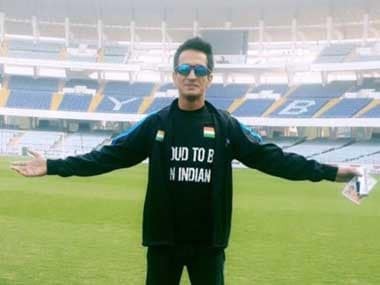 Payne cut a sorry figure with his brazen tackle but still escaped without a booking from referee Santosh Kumar in his maiden outing on Indian soil. East Bengal had the best chance to go one up in the 56th mintue, in what could have been an own goal with Plaza's strike taking Chinglensana Singh Konsham's deflection before Kaith parried it away. Bengaluru FC skipper Sunil Chettri's record-breaking strike denied Aizawl FC full points as the much-anticipated Hero I-League match ended in a 1-1 draw in Aizawl on Wednesday. Both goals were scored in the first half, within a span of five minutes. Brandon Vanlalremdika (40th minute) opened the goalmouth while Chhetri (45') cancelled the home team's lead at the stroke of half time. Meanwhile, the goal added another feather in the talismanic striker's hat as he leapfrogged Bhaichung Bhutia to score the most number of goals combining NFL & I-League. Bhutia had enjoyed the lead until today with 89 goals. Bengaluru FC did no less scoring an equaliser just five minutes later when Chhetri received the ball and shot it straight into the top corner of the box from about 30 yards away. The half time ended with the 1-1 tie. Aizawl FC looked the better team in the first half with three shots on target while the away team had a single shot on target. Away keeper Amrinder Singh also saved his team in the 32nd minute when he successfully blocked a powerful shot by Alfred Jaryan moments after Al-Amna's header hit the bar. In the second half, in front of a packed ground, Bengaluru FC missed their chance to lead in the 55th minute when Chhetri stepped up to take the penalty which was punched away by Aizawl FC keeper Albino Gomes. Just minutes before the match ended, Zohmingliana Ralte headed a free kick by Lalramchullova but that failed to see the back of the net and flew over the bar instead. Aizawl FC maintain their enviable unbeaten record at home in the ongoing season. Though Bengaluru FC halted their four-match winning streak at home, the highlanders would be happy with the solitary point earned from the game. Aizawl FC keeper was declared the Hero of the Match for his splendid blocks. Aizawl FC remain third in the table with 17 points from 9 matches with East Bengal and Mohun Bagan above them. Bengaluru FC remain stranded at the fifth spot with 12 points playing one match less. Khalid Jamil, Aizawl FC coach commented on the match, "We deserved full points judging from the way my boys played." Bengaluru FC coach Alberto Roca opined, "We should've gotten more penalties, we deserve three points. We can still be champions this season." Minerva Punjab FC played out a goal-less draw with DSK Shivajians in the I-League in Ludhiana on Wednesday. This was Minerva Punjab FC's fourth draw in the ongoing league. Minerva Punjab FC played in a 4-3-3 formation against Dave Rogers' team, which started with Real Madrid academy cadet Juan Quero marshalling the attack. Kareem captained the home side and veteran India custodian Subrata Paul led the DSK Shivajians. DSK came close to scoring on many occasions and the first half saw a controversial handball penalty appeal denied in favour of Minerva Punjab.